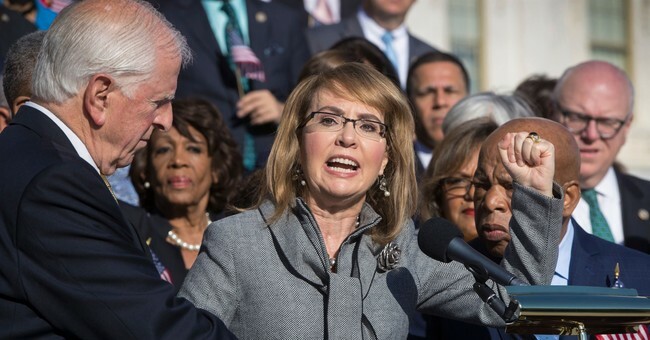 The Giffords gun control group has made it their mission to flip 10 pro-gun Congressional districts across the nation. The group wants to replace legislators who "have long prioritized the gun lobby’s agenda over taking action to reduce gun violence and protect public safety" with those who "are committed to protecting kids from gun violence." The group plans to display a 3-D printed child hiding under a desk, which represents "active shooter drills" that take place on school grounds. The top of the desk has an etching that says, "22 kids are shot every day in America." According to former Congresswoman Gabrielle Giffords, too many children know the trauma of gun violence, which is what launched this statue campaign. • Parkland, Florida (FL-22) — Organizers will unveil the statue and host a voter registration drive for students aged 16–18. The organizers are inviting local elected leaders and Diane Wolk-Rogers, a Stoneman Douglas teacher, to speak during the press conference portion of the drive. • Las Vegas, Nevada (NV-03) — Karl Catarata, a March for Our Lives Las Vegas leader, Organizing for America community organizer, and UNLV student, will organize a voter registration drive and press conference in conjunction with the statue unveiling at the Center for Social Justice on the UNLV campus. In Southern Nevada, the gun safety movement is fighting to keep Nevada’s 3rd and 4th Congressional districts in the hands of gun violence prevention champions. Susie Lee is running to fill the seat vacated by Congresswoman Jacky Rosen, who is running for the US Senate, and Steve Horsford is running to return to Congress in the seat currently held by retiring Representative Ruben Kihuen. Lee, Rosen, and Horsford all support important efforts like passing laws to keep guns out of the hands of domestic abusers and closing loopholes in our background check system. • Denver, Colorado (CO-6) —Youth organizer Krista Choate will host a voter registration drive during the unveiling of the Last Lackdown statue. Krista’s representative, Congressman Mike Coffman, has positioned himself against any form of gun violence prevention. Rep. Coffman has the enthusiastic backing of the NRA for his support of concealed carry reciprocity and the loosening of restrictions on interstate gun sales. Congressman Coffman is running for re-election against gun safety champion Jason Crow. • Minneapolis, Minnesota (MN-03) — Student activist and Giffords Courage Fellow Sydney Lewis has been an outspoken advocate for gun violence prevention in the state of Minnesota through the Eden Prairie chapter of Students Demand Action. To accompany The Last Lockdown Statue, Sydney will be organizing a voter registration drive. The event will feature a rally portion with local gun safety champion candidates and student activists. Congressman Erik Paulsen, who represents Minneapolis, has received $20,000 from the NRA and has been a barrier to congressional efforts to take action to save lives. Dean Phillips has been running a strong campaign in the suburbs of the Twin Cities. When he gets elected to Congress, Dean Phillips will be a gun safety champion who fights to enact universal background checks, put an end to the gun show loophole, and keep people on the no-fly list from buying guns. • Irvine, California (CA-45) — Local youth organizer Skye Wagoner is organizing a voter registration drive and statue unveiling in Irvine, CA. The first portion of the event will take place in CA-48, in front of Dana Rohrabacher’s office in Huntington Beach where 22 desks, including the statue, will be on display to symbolize the 22 children shot in America each day. The event will then move to the office of Congresswoman Mimi Walters for a voter registration drive and art installation. Lastly, the event will move to the office of CA-42 Representative Ken Calvert, a congressman who has longed accepted NRA contributions. • Milwaukee, Wisconsin (WI-01) — Giffords Courage Fellow and 50 Miles More Executive Director Katie Eder and 50 Miles More Outreach Director Tatiana Washington, will host a Last Lockdown statue unveiling and voter registration drive in Milwaukee to remind the community that voting in the midterms can save lives. • Houston, Texas (TX-07) — Giffords Courage Fellow Megan McGuire and local youth organizer, Marcel McClinton from Orange Generation will unveil The Last Lockdown statue in front of Houston City Hall. In addition to hosting a voter registration drive, Megan and Marcel will be joined by additional speakers for a press conference, where they’ll call on voters to elect new leaders dedicated to keeping kids safe from gun violence. The Texas seventh district is currently represented by Rep. John Culberson, a champion of NRA-backed policies. • Sarasota, Florida (FL-16) — Local Sarasota youth organizer Hailey Landry will unveil The Last Lockdown statue and host a voter registration drive and press conference about gun violence in her community. Student speakers, teachers, and local leaders have been invited to speak. Congressman Vern Buchanan has proven himself an ineffective leader in Congress since being elected. Buchanan has repeatedly taken NRA money and has done the gun lobby’s bidding. This year candidate David Shapiro, a local businessman, has pledged to be a gun safety champion. • Spokane, Washington (WA-05) — Youth organizer Brooke Bennett will host The Last Lockdown statue unveiling to bring attention to the gun violence epidemic in our country. Spokane students and teachers are invited to discuss the impact of gun violence in Spokane and organizers will register voters. Spokane is represented by Cathy McMorris Rodgers, a member of Republican leadership and a barrier to effective gun safety legislation. Vying to replace McMorris Rodgers is Lisa Brown, former Chancellor of Washington State Spokane and a supporter of banning bump stucks, closing background check loopholes, and addressing gun violence as a public health crisis. • Philadelphia, Pennsylvania (PA-05 + PA-06) — Youth organizers Sophia Qureshi and Julia Spoor will organize a voter registration drive at Philadelphia Museum of Art that features The Last Lockdown statue. Katie Kendrick, a junior at the George school and gun violence survivor, and Saira Salyani, chair of High School Democrats of Pennsylvania, will speak.